A bathroom design isn’t complete until you have placed all your items. Many people forget about a number of bathroom essentials, leaving them out of the budget and once the bathroom is completed, they end up spending more money on toilet roll holders, soap dishes and bathroom cabinets. There are certain things that every bathroom needs, there is the obvious, the toilet, basin and bath or shower, in some cases a bath and shower. These are where the majority of your budget will go. Now what about the little things that make your bathroom complete, how about stainless steel mirror cabinets? These cabinets give you a chance to not only have additional storage for some of your bathroom items, but it combines with a stylish stainless steel cabinet and the advantage of a mirror. As you probably know every bathroom needs a mirror, a mirror offers more than you just looking at your own reflection, a mirror can reflect natural light into the space, making it feel lighter and brighter. The stainless steel mirror cabinets come in a choice of designs and sizes to complement any bathroom space combining elegance, sophistication and style to blend in with your overall design. Have you thought about a radiator? Radiators ooze warmth, wonderful when getting out of a hot bath on a cold day. Don’t worry you don’t have to have one of the ugly old radiators that are in many homes across the UK. 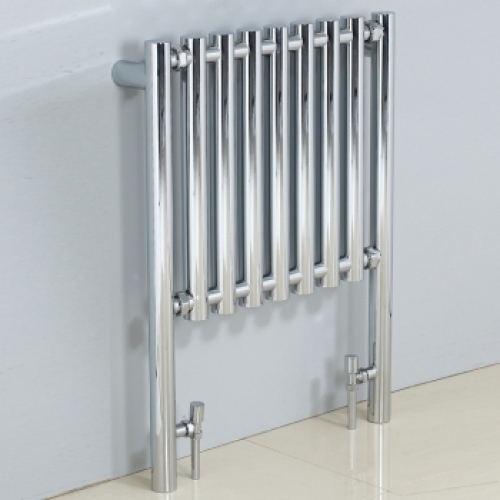 The radiators today are stylish, finished in chrome and look like a masterpiece on any bathroom wall. Now you have your stainless steel mirror cabinets and your designer radiator, both working well in the space, blending together and enhancing the room. It’s time to look at the basic accessories, your toilet roll holders, towel rails, robe hooks and tumbler holders. The advantage to the accessories available today is that they are also finished in polished chrome ensuring that all your items you need to complete your bathroom design blend in with your taps and shower valves and heads. When looking at the finer details to complete your bathroom design, ensure that you pay careful consideration to the shapes you have incorporated, the overall design and then see the finished product in your mind. Using stainless steel mirror cabinets, designer radiators and a choice of accessories will not only complete your bathroom to perfection, but will offer a functional and practical space. You’ve just finished designing your perfect bathroom. You’ve gone for the roll top bath, the luxurious walk in shower and the counter top basins and now you’re stuck on the radiator. These days you don’t have to go for the unsightly radiators that have plagued us for so many years, there is no hard and fast rule that says you have to have a white ugly radiator that is floor mounted any more. There are some stunning designer radiators available, finished in chrome to blend in beautifully with your new bathroom design. The designer radiators that are available for your bathroom come with two options, there are the wall mounted designs and the floor standing designs. The beauty is the chrome finish which enhances your bathroom design, complementing the space and blending in with the taps you have chosen. When it comes down to selecting designer radiators you need to take your complete bathroom design into consideration. How much space you have available is important. For example, compact bathrooms benefit from the wall mounted designs, this doesn’t compromise floor space and works as a piece of modern art on your bathroom wall where you can hang a towel and keep it warm while you bath or shower. The wall hung designs are usually rectangular in shape that hang vertically, they have two straight bars on either side, either tubed or square design and then bars horizontally down them, also tubed or square, depending on the design you have chosen. There are also the curved designs, these are stylish in any bathroom design, pushing out again the wall slightly in a modern and sophisticated bend that blends in with your bathroom décor. The floor mounted designer radiators on offer these days are definitely not ugly, again they are finishing in polished chrome and while the same shape as your traditional radiators you probably have throughout your house, they have straight vertical bars which look fantastic with any bathroom design. Pay careful attention to the size when choosing designer radiators, measure your wall or floor space before making a decision. You don’t want your new radiator to overpower your bathroom design, it should complement the space, blend in with your fixtures and fittings and work as an art piece that becomes a show stopper. These days bathroom are all about style, sophistication and being modern. We all want a beautiful bathroom, a space to be proud of where we can just soak our worries away in a hot bath after a long day. A beautiful modern bathroom doesn’t just fall into place, it takes planning, time and effort. When it comes to modern you need clean lines, light colours and minimalist items. Now I’m not sure what your bathroom looks like, you may have a bathroom out of a magazine or a real cottage bathroom, but I am talking about any size bathroom and turning it into a modern delight. When it comes to modern you are looking at white, glass and shiny chrome. Sticking with these three things will help you find the bathroom of your dreams. Then there is your wall art and what better way to turn a wall into a feature wall than with designer radiators. If you are looking for a designer radiator that can be a centre piece in your bathroom, make a statement and offer a “wow” factor, then the Osimo chrome radiator will not disappoint you. These designer radiators ooze sophistication and style. They are tall radiators and the number of bars will be determined by the size you choose. These designer radiators will work beautifully in large and small bathrooms, finishing off the picture perfectly. This bathroom radiator offers straight lines and is available in two handy sizes, making them an ideal choice for any bathroom. 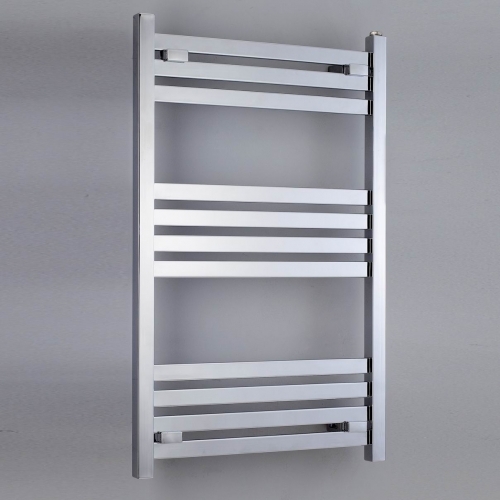 The straight lines enhance its modern appeal, while Davina radiators offer fantastic wall art on any bathroom wall. 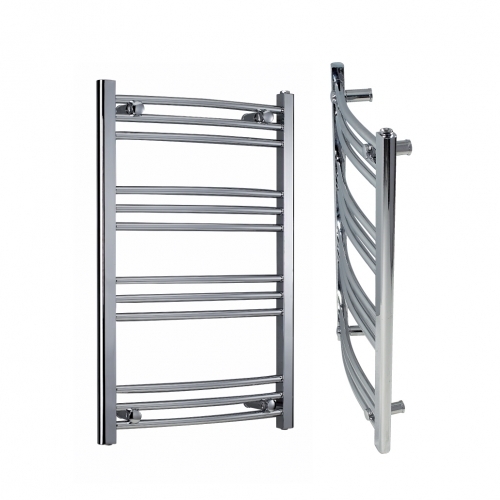 Stylish, sophisticated and elegant are the words that come to mind when describing the Trento chrome radiator. These designer radiators are streamlined and ultra modern. They are a simple design that is so spectacular that they will blend in with your modern bathroom and cause a stir when anyone steps through the doors. Mix straight lines and curves and you get the Rochelle curved chrome radiator. With a curved front, these designer radiators add that little bit of difference to your bathroom design. The gleaming chrome is a wonderful addition to any bathroom space, the straight lines blend in with the modern feel and the curve is a wonderful addition to any bathroom. For the smaller bathrooms or those where you want a floor and wall mounted designer radiator, the Mia radiator does not disappoint. These beautiful chrome radiators come with spectacular curved bars adding richness and stylish design to your bathroom space.